Solution: Damage to the legs of chairs or bar stools often stems from improper use by customers and staff, something that can happen on a regular basis. 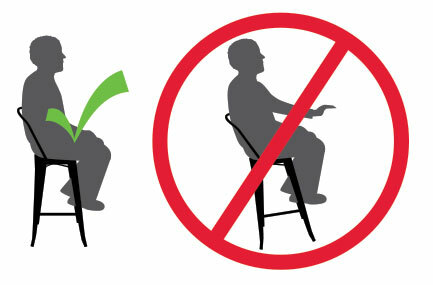 For example, customers may lean back in their chair putting all of their weight on the back two legs. Yikes! If you see this happening, politely ask the customer to refrain from doing this in hopes to keep the leg strength strong…and of course to save your customer from getting hurt. Another example is when staff members unknowingly use a chair or bar stool improperly. As a standard procedure when sweeping and mopping floors, most restaurant staff members place the chairs upside down on the tables. They clean the floors, let them dry, and proceed to lower the chairs back to the floor. The issue arises when the staff member slams the chair or bar stool onto the floor with such force that the leg strength is compromised. After this occurs many times, it can in fact make the legs of chairs and bar stools look bent. To avoid this, it’s important to show and/or communicate to staff members the proper procedure to gently lower chairs and bar stools back onto the floor so as to keep the legs nice and strong. Solution: Scratches on floors from chairs and bar stools are often due to the absence or wearing of one or more floor glides. 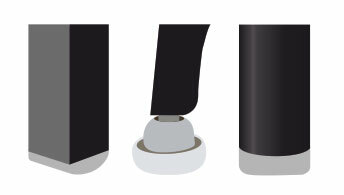 Floor glides are the pieces of rubber or hard plastic that are placed on the bottom of the legs of a chair or bar stool to protect the floor. Without them, the chair will scrape along the floor, cause some scratch marks, and even make a sound that can be like fingernails down a chalkboard. To avoid this, be sure to regularly check the wear of floor glides as well as that they are all in place. It’s also a good idea to keep a few extra glides on hand, just in case. Following these suggestions will keep your floors scratch free and looking fabulous. Solution: It’s important to be aware of what your table tops are made of and how to properly care for them, especially when it comes to wood table tops. In the case of wood, it is a natural material that expands and contracts with the changes in temperature. 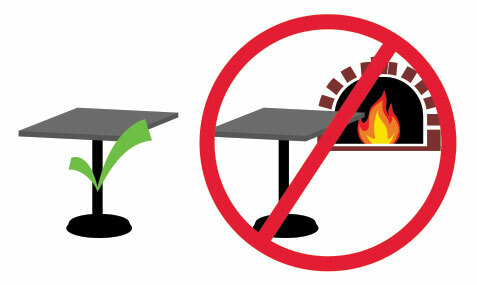 With any wood product, including table tops, it is important to keep them away from direct heat to avoid cracking. When we say direct heat, we mean in direct sunlight through a window, under a heating vent, or in a warm area that can become humid and warm from the heat of a hot oven. It is equally as important to not place a hot tray, sizzling pan, pizza pan/pizza box, or anything right out of the oven directly on the wood top, or any table top for that matter. If there is no way around it, invest in products to protect the table tops from heat generated from hot foods like a hot plate or an elevated pizza tray. These items will be worth your money and you won’t have to witness an altering of your table top finishes or heat stains that will appear if you’re not extra careful. Solution: If you are experiencing wobbly chairs or bar stools, first check the floor glides to make sure that all four are present and not worn out. If they are in place and not causing the wobble, loose screws that were either not tightened at assembly or have worked loose over time could be the issue. With regard to assembly, a lot of commercial restaurant furniture companies ship their chairs and bar stools with the seats unattached. This enables them to stack the furniture and ship more products at a lower price. Also, by packing the seats tightly together, it reduces the likelihood of shipping damages. So, when assembling your seats on site, it is important to follow the proper instructions as well as use the suggested tools with the hardware provided. Make sure that screws are snug and not too tight so as to avoid further damage to the seat. In addition, it is just as important to routinely check the hardware on all tables, chairs, and bar stools, and tighten them as needed. Solution: When purchasing furniture for your bar or restaurant, it is important to know where these items are going to be placed and how they are going to be used. If you need chairs, bar stools, and tables for an indoor dining area, it is important to purchase items that are intended for indoor use. The same goes for outdoor furniture items. 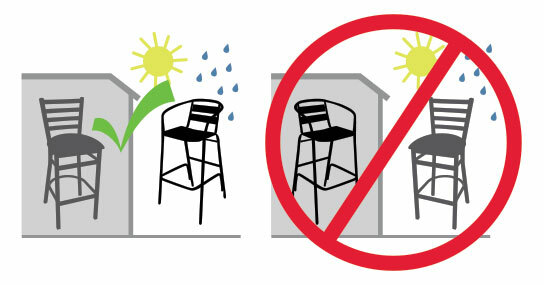 An outdoor chair, bar stool, or table intended for outdoors, should only be used outdoors. Or, maybe you want items that can be transferred to and from an indoor space to an outdoor space. Buying items that have this dual use is the key. Also, chairs and bar stools are meant to be sat in and tables are meant to be used for eating off of. Any other uses that customers or staff might be using them for can affect the longevity of the item. Staff and management should be aware of the intended use of all restaurant furniture and doing what is necessary to make sure that use is maintained. Buying restaurant furniture is an investment. As with any investment, you want to protect it so that you get your use out of it for years to come. But along with that comes your responsibility to do what it takes to keep your furniture in its most pristine state. Taking care of your items with the suggestions above will help deter common problems and likely, will last for the years that you were hoping for.